This bridge next to the mill was removed last year. The East Arcadia Feed Mill sits next to Turton Creek just outside the east side of Arcadia. The East Arcadia Feed Mill was built in 1900. The Korpal Valley District 2 school was built in 1906 and moved to the feed mill after the school closed in 1943. I’ve always been fascinated by unique buildings. Whether it’s old barns, factories or abandoned houses, the structures speak to me. There are hundreds of these buildings scattered across our rural and urban landscape. Some are still in use, others are vacant waiting for a new purpose and many have lost the battle with nature and years of neglect. Recently I was drawn to an old feed mill off Hwy. 95 on the edge of the city of Arcadia in Trempealeau County. Located next to a creek and a dam, it was obviously water-powered at one time. It was a cold winter day when I passed through but I pulled over immediately to take some photos. Standing next to the feed mill is an old schoolhouse — at least the front of it. The building has collapsed in the middle. A roadway — aptly named Mill Road — ends at the mill and is barricaded before a creek. The road continues on the other side of the creek, so there must have been a bridge. A sign identifies the building as East Arcadia Feed Mill. Broken windows — some wide open, some boarded over, some still with glass — cover the building. The faded red clapboard siding has some holes. The front door was open, but I was not dressed for exploring nor did I want to trespass. I stopped for a few minutes and was on my way. But I left with some questions. Who owns the building? What was its history? How many farmers did it used to serve? When did it close? Some research resulted in answers. The building is apparently owned by a man from Arizona, according to a story that I found in the Trempealeau County Times. 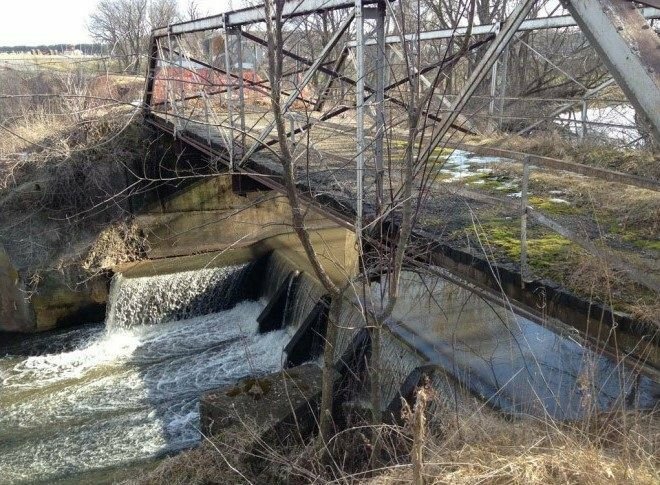 Last year, the town of Arcadia received federal funds to help remove the 60-foot bridge that was built over Turton Creek. The bridge had been closed for a few years and was in danger of falling down. The environmental paperwork filed with the state of Wisconsin provided more information. The East Arcadia Roller Mill was built in 1900 for millers Michael Stelmach and John Kamla. It is a two-story, side gable gristmill built on a stone foundation with frame construction and wood siding. There are two doors and a metal hoist frame, used to tilt trucks for unloading, located west of the entrance, adjacent to a pair of grain loading doors at grade level. A two-story, shed roof addition extends on the north rear elevation and the stone basement level is visible above the riverbank. The milling machinery has been removed, but there are still chutes, pulleys and the turbine are stored on-site. The purpose of the building was to accommodate grain, flour and feed transport and storage. The first and second floors have tongue-and-groove wood wall cladding and wood floors, and four large timber columns provide structural support for the open layout of each floor. There is an internal grain elevator, which runs from the basement to the roofline. Storage bins located on the second floor are connected to delivery chutes on the first floor. Stairs are located near the northwest corner of the first floor and provide access to the second floor and basement. The one-room schoolhouse was built in 1906 to serve Korpal Valley District 2. It was moved to the feed mill location and was used an office after the school closed in 1943. Next to the mill is a concrete dam built in 1915. Holes along the top of the dam provide a clue to an important part of water power — the mill pond. The holes once held posts that were used to hold flashboards to dam up the creek. The water was used to power a wheel turbine in the powerhouse, which have been removed. The discharge area is still visible. The mill had been converted to electricity for grinding, but there aren’t many former water-powered mills left. Its future seems unclear. The building’s owner had it listed for sale a few years ago, but I was unable to contact him about his plans. With broken windows and open doorways, the elements are taking their toll. The schoolhouse looks to me that it’s too far gone. Without some work and funds, another piece of Wisconsin farming history will soon be beyond repair.